It's really all about the performers. Pleasing the artists will always increase the probability of pleasing your audience. Nearly every performer requires a monitor system for sound reinforcement on stage. A touring band will typically use two mixing consoles, one by the stage for their monitor system, and one in the audience for the house sound. Most regional acts can by mixed with one console pulling double duty. Touring bands will often have in-ear monitors mixed by someone they trust with not only their art, but their ears. In the absence of in-ear monitors, you will find stage monitors. It's not unusual for every band member to have their own monitor or two with their own custom mix. A good audio engineer can communicate with the artist and understand their requirements and wishes. How are the acoustics? When sound comes in contact with an object it will either reflect, be absorbed, or use the object as a transmission device. Metal, glass, and concrete will all cause sound to bounce around like a super-ball. Wood will tend to make sound warmer (that's why all those recording studios have wood floors), thick material like curtains, carpet & people will mostly absorb sound. Also, see power. Without electricity the show can't go on because all equipment needs juice. Take some time to add up the total amount of power required. Remember volts x amps = watts! Check the amperage and voltage rating on all the equipment, then apply the equation across everything you need to power. Generally you will express this in kilowatts (thousand watts) or in a number of circuits required. For example, if your total requirements are 2200 watts, or 2.2kw, this will generally "fit" on 1 standard circuit (not outlet, the WHOLE circuit). It is not unusual to bring in diesel powered generators to provide power for events. Having a separate generator for sound and lights is standard since dimmer racks can easily dump noise into a sound system tied to the same main. Keeping it separate keeps it clean. Small portable sound systems can often use just the house wall outlets, but do the math! A ballroom band will typically need several 20 amp circuits for their stage equipment. Add to that at least four circuits for the sound and monitor system, then add lights, projectors, catering and various other equipment. It adds up quickly and can often catch event planners of guard especially if someone is not coordinating the power. It is not uncommon for an event to require generators or 3 phase power connections. A typical touring audio system will require 3 phase, 200 amp power, while a touring lighting system is often 3 phase 400amp. It's required to have a house electrician on hand to make, inspect, and to a degree, take liability for the connections. Smaller ballroom shows can usually get by with the house power, but often the venue will stick you with an extra charge to make a power drop. Don't cut corners here. Saving that $100 won't seem worth it when the band strikes their first chord and everything goes black. Without power you can't have a show! 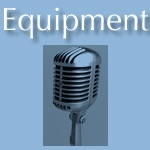 Choosing the right equipment for an event requires great coordination skills. What does the band need? What does the CEO need? Are the house lights adequate? A common pitfall I've seen is relying on a house sound system that is designed for business meetings for huge galas. Those ceiling speakers work fine when people aren't liquored up and they are pretending to take notes, but give them a few drinks and you'll never get them to shut-up. People talking in a ballroom raises the noise floor considerably. Those 6" ceiling speakers all wired together in a series suddenly won't command an audiences' attention. Ideally, one audio system should be used for the band, for the talking heads, and for announcements. You should hire a professional audio engineer to operate the equipment and to coordinate the audio requirements. The weekend warrior band might have a system they throw in their trunk, but if they're pro, they will probably have a contract with a sound and lighting production company. Often they will have a contract rider that specifically states their technical requirements. In this case, hire a production company to fill the rider or you probably won't have a show. Also beware of the "band is bringing their system so we should be fine.." scenario. Often this means the band will try to mix from stage (where they have no idea how it sounds in front of the speakers.) Usually when I see this I am happy because it helps to clear the crowd out faster and I can go home. Generally it's not a great idea to let a musician touch the sound equipment. Don't get me wrong, I love them, but heed my advice. I stopped going to a bar that allowed musicians to run their own sound because every time I went in I'd find myself on-stage fixing that howling feedback problem, or that buzz in the system. Let the musicians play their instruments and hire a pro to mix the sound, everyone will be happier. Read about live sound basics.. Create an atmosphere with various types of lighting. Par fixtures on round-bases can quickly and dramatically add focus to elements of your room layout. Stage lighting can include anything from a few fixtures on aluminum tripod stands, to large spans of truss loaded with moving fixtures, color-changers, ellipsoidal fixtures, par fixtures, really the sky is the limit. If your event is outdoors, you must consider exit lighting.